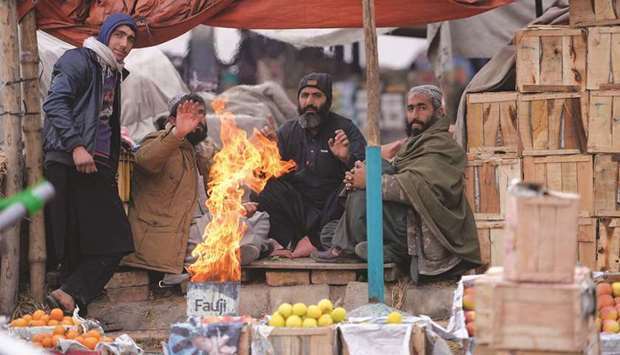 Vendors heat up around a fire at a fruit market during a cold and foggy morning in Islamabad yesterday. Pakistan is expected to receive rainfall from January to March this year which would be slightly above normal over its upper parts. In its seasonal forecast, the Met Office said that as per global climatic conditions, Pakistan was expected to receive near normal rainfall during the period. Slightly above normal rainfall is expected in Khyber Pakhtunkhwa, northern Punjab, Gilgit-Baltistan and Azad Jammu and Kashmir (AJK). The mountainous areas of upper Khyber Pakhtunkhwa, Gilgit-Baltistan and AJK are likely to receive snowfall during the period. Normal rainfall is likely to occur in south Punjab, Balochistan and Sindh. The average temperatures are expected to remain near normal in most parts of the country. Northern parts of the country, including upper KP, Gilgit Baltistan and AJK may get slightly above normal rainfall/snowfall during the current month. South Punjab, Sindh and Balochistan are expected to receive slightly below normal rainfall. Due to the low temperature, foggy weather conditions are expected in the plains of central and lower Punjab, Peshawar and Hazara division of KP during the month. Meanwhile, the westerly wave that entered the country last night, cleared fog from many cities in the plains of the country. The overall weather remained cold and dry. Malam Jabba recorded 4mm rain and Saidu Sharif and Parachinar 2mm. Malam Jabba also received 2 inches of snow. The minimum temperature in Kalam and Skardu was -9 degrees Celsius, Astore -8, Gupis -7, Hunza and Bagrote -6, Gilgit, Rawalakot, Malam Jabba and Dir -3, Parachinar -2, Chitral, Drosh, Kakul, Muzaffarabad and Bunji -1.